Chris Brammer Wins Event #45! 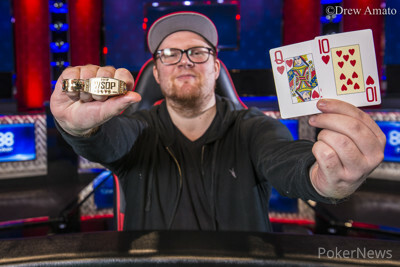 Chris Brammer beat out a field of 505 players to win Event #45: $5,000 No-Limit Hold’em (30 minute levels) for a payday of $527,555 and his first WSOP gold bracelet. The top 76 finishers got a share of the $2,438,250 total prize pool, and the top five received six-figure payouts. 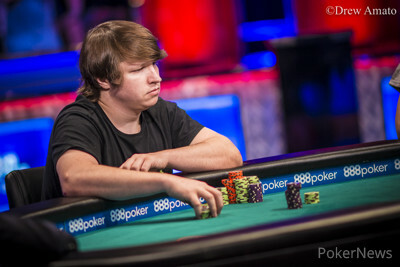 Chris Brammer endured a bit of a lull in WSOP success, as his two previous WSOP final tables both came back in 2012. 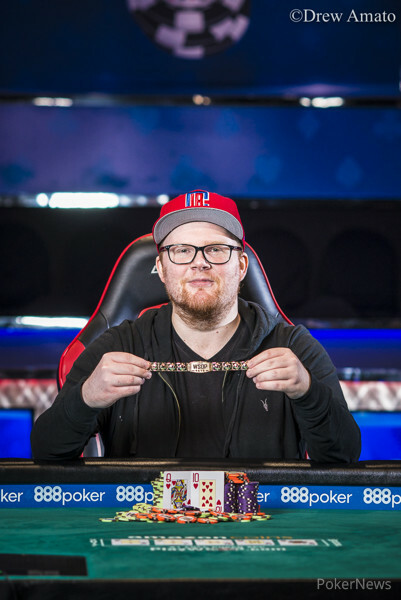 The British poker pro finished fifth in the $10,000 No-Limit Hold’em 6-Handed event for $200,502 and fifth again in the WSOP Europe Main Event for $270,908 that same year. Regarding his fifth-place finish in the 2012 $10,000 No-Limit Hold’em 6-Handed event, he commented, "That one hurt for a long time. I made a final table at World Series of Europe that same year, but there hasn't been any since, and I've been coming here every year. It's been a while." "It was a turbo tournament, so the blind levels went up fairly quickly. That creates a lot of action, and it's important to win those all-ins. And I think I won pretty much all of them. I was dealt a lot of good cards. There were situations where I could shove into them and put pressure on them." In the fifth hand of the official final table, Brammer doubled through Jett Schencker with ace-jack against ace-king, blind versus blind, when he hit a jack on the flop and held. During six-handed play, Brammer got his run going when he doubled through Oliver Weis, again blind versus blind, with pocket jacks against pocket tens. With five left, Brammer took a hit to his stack when he doubled up Jett Schencker, raise-calling with queen-jack against Schencker’s king-queen, which held up. A little while later, Brammer regained the chip lead from Schencker when Brammer shoved with queen-ten offsuit on the button and was called by Schencker with ace-eight offsuit. Brammer flopped a queen and went runner-runner full house to double up. He took another hit to his stack when he called Yevgeniy Timoshenko’s shove with pocket sevens, and Timoshenko hit a jack on the river with queen-jack to double up. After that, Brammer mostly took down blinds and antes with no showdowns until he, again, clashed with Timoshenko. He had Timoshenko in bad shape with pocket queens versus queen-ten suited, and his queens held up to eliminate Timoshenko in third place. Brammer carried a 2:1 chip lead into the heads-up match with Schencker and got it over with in a hurry. In the very first hand of heads-up, Schencker raised on the button with ace-jack offsuit, and Brammer shoved with queen-ten of hearts. Schencker called, and Brammer spiked a ten on the flop and held up to eliminate Schencker in second place and win the tournament. During the final table, Brammer’s rail provided much celebration as Brammer won many all-ins and took down what seemed like pot after pot. When he spiked the ten in the final hand, his rail filled the Brasilia Room with cheers. "I've been on both sides," he said after the win. "I remember being in the Pavilion Room up on the stage for that six-max final table, and my rail was spilling over onto the floor. I was here last week for Chris Moorman's, and it's just amazing to be a part of it. You can't feel sad at any point, because there's just so much support behind you." Hand #85: Jett Schencker raised to 500,000 from the button, Chris Brammer reraised all in from the big blind, and Schencker called all in for 4,250,000. The flop came down , giving Brammer the lead with a pair of tens. "Queen!" yelled Sam Grafton from Brammer's rail. "He'll still have outs!" yelled somebody else on Brammer's rail. The turn and river completed the board, officially locking up the victory for Brammer. Jett Schencker finished as the runner-up for $326,051. Hand #84: Chris Brammer raised to 500,000 on the button, and Yevgeniy Timoshenko went all in for around 2,500,000 from the small blind. Jett Schencker folded his big blind, and Brammer snap-called. Timoshenko was at risk and in bad shape. The flop did not offer much hope for Timoshenko, as he was drawing to runner-runner tens. The turn had Timoshenko drawing dead, and the came on the river. 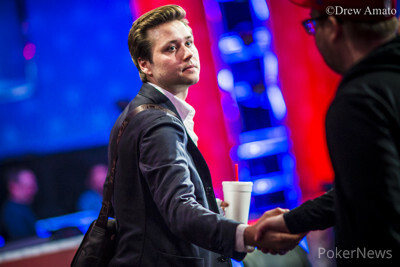 Timoshenko was the third-place finisher and received a payday of $223,574 for his performance in the tournament. Hand #81: Chris Brammer shoved on the button for around 4,450,000 and took down the blinds and antes. Hand #82: Jett Schencker completed in the small blind, and Chris Brammer moved all in from the big blind. Schencker folded, and Brammer took the pot. Hand #83: Action folded to Brammer in the small blind, and he went all in for around 5,000,000. Timoshenko folded his big blind, and Brammer won the pot. Hand #76: Chris Brammer received a walk in the big blind. Hand #77: Jett Schencker raised to 400,000 from the button, and both blinds released. Hand #78: Jett Schencker received a walk in the big blind. Hand #79: Yevgeniy Timoshenko raised to 400,000 from the button, Jett Schencker three-bet to 1,100,000 from the small blind, Chris Brammer folded his big blind, and Timoshenko folded. Hand #80: Chris Brammer raised all in from the small blind for about 4,100,000, and Yevgeniy Timoshenko folded his big blind.